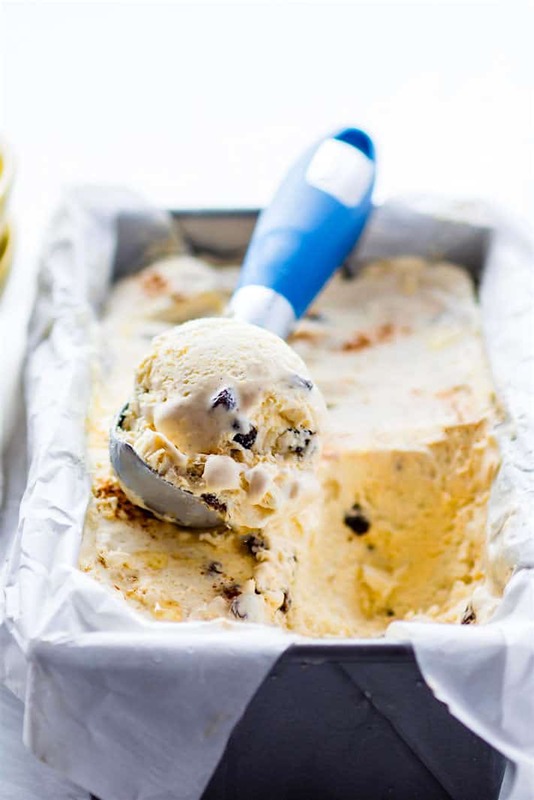 This homemade ice cream recipe makes creamy no-churn ice cream with no condensed milk! It’s fruit sweetened ice cream made with just 5 ingredients and no added sugar. This naturally sweetened ice cream makes the perfect frozen treat for summer. Paleo and vegan options. 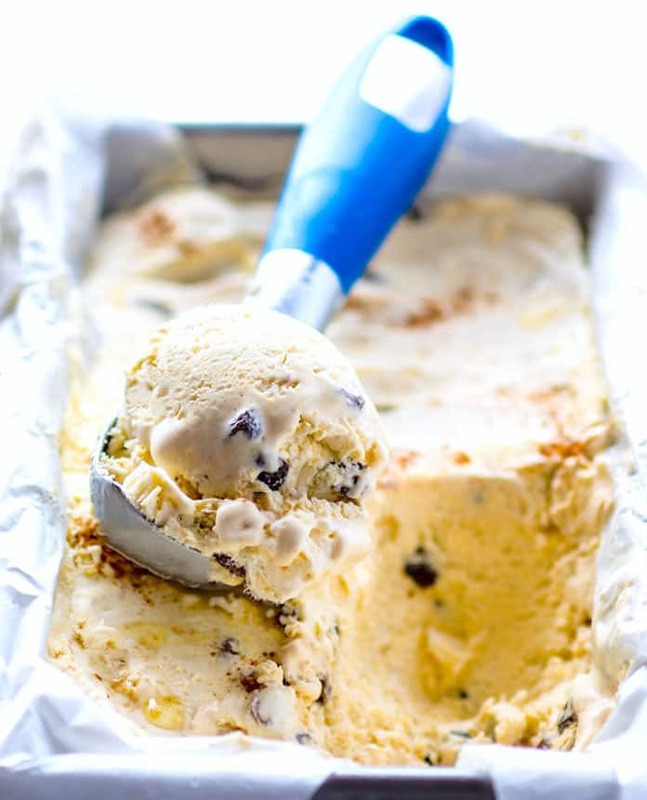 Let’s talk about this homemade ice cream recipe for a minute, y’all. Homemade, fruit sweetened, no churn ice cream. As many of you know, or will now know, I’m not a huge fan of FROYO. Gasp!! I know! Sorry, but it’s just not creamy enough for me. I am not fond of the consistency and to be honest, I think it’s too sweet. Well, depending on the brand or flavor. I’m an ice cream girl or gelato girl through and through! It’s a childhood favorite of mine and nothing beats the summer memories I have of sitting on the front porch of Marble Slab Creamery, eating ice cream and talking “life” with my dad. Yes, those are some of the best memories of my life. You think I’m kidding, but I’m not. So fitting since Father’s Day is Sunday, right? But my main point here is this. Ice cream is nostalgic. And there’s a way we can STILL continue to enjoy this classic creamy frozen treat without all the guilt. Meaning, we can make it HEALTHIER with REAL food, sugars or additives, and still make it CREAMY! PROMISE PROMISE! Fruit-sweetened no-churn ice cream is like the easiest thing evah evah (that’s slang for EVER x 10). Ready for it? Let’s discuss the ingredients in this homemade ice cream recipe. In order to make no churn ice cream, you usually need condensed milk to thicken and sweeten it. Yes, condensed milk is real food, so there’s no real issue there. UNLESS you have a dairy allergy, are watching sugar intake, or are vegan/paleo. Ya know? I know many of us feel better eating that way in some form or another, right? And why I have a homemade vegan sweetened “milk” sauce recipe too! Well, here’s a COOL (pun intended) way to make no churn ice cream. Especially for those with allergies or are vegan, etc. 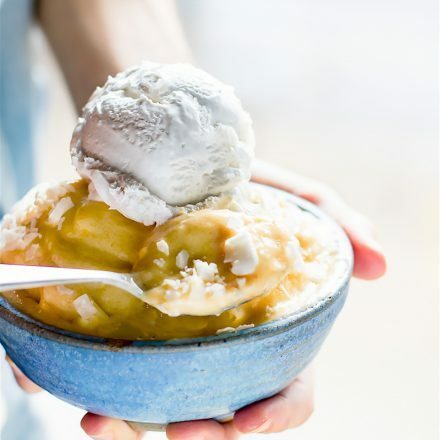 All you need to do is replace the condensed milk with frozen banana and another fruit source. For instance, I use a frozen banana and mango mixture. Then, blend it all together. After you blend that up and make it extra creamy, you combine it with whipped coconut cream (like in my vegan coconut frosting) or you can use heavy whipping cream if you are not vegan. I’ve tried both creams with this method and both work GREAT! Once you’ve whipped (in mixer) and blended, all you have left is to add additional flavors. For instance, I use cinnamon, raisin, honey (or maple syrup), and there may have a been a wee bit of rum. Yes, rum raisin. Shhhh… don’t tell anyone I spiked the ice cream. So where was I, yes… oh so creamy and dreamy fruit sweetned no-churn ice cream. Don’t mind my grammar, it’s Friday and I’m having fun with it. P.S. 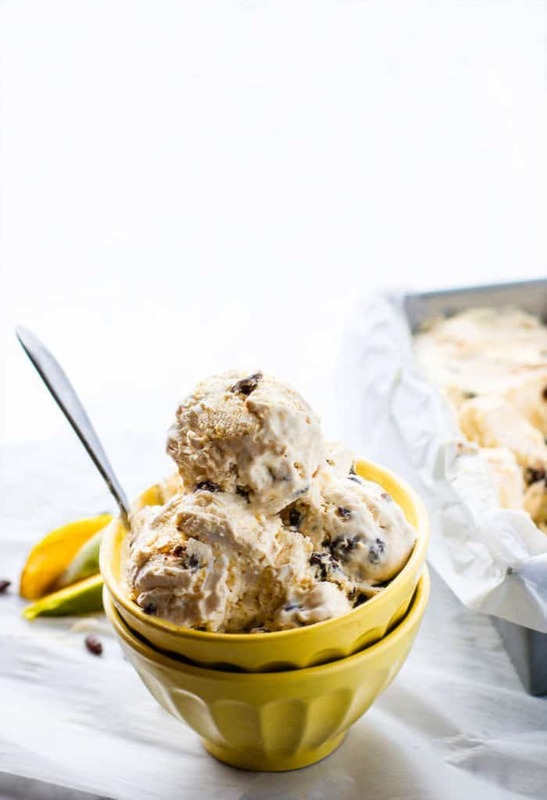 If you want to make this homemade ice cream recipe EPIC, soak the raisins in RUM, then add them to your ice cream with a bit of cinnamon. It’s unreal good! This homemade ice cream recipe makes fruit sweetened no-churn ice cream without condensed milk and only 5 ingredients. 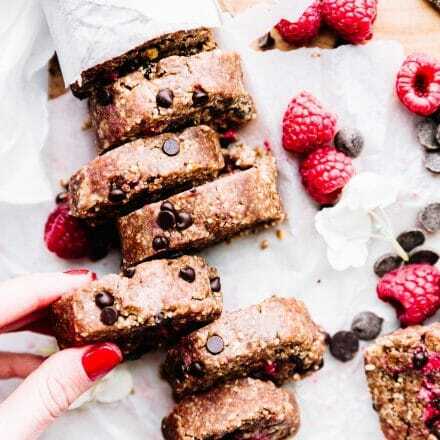 Includes paleo + vegan options. 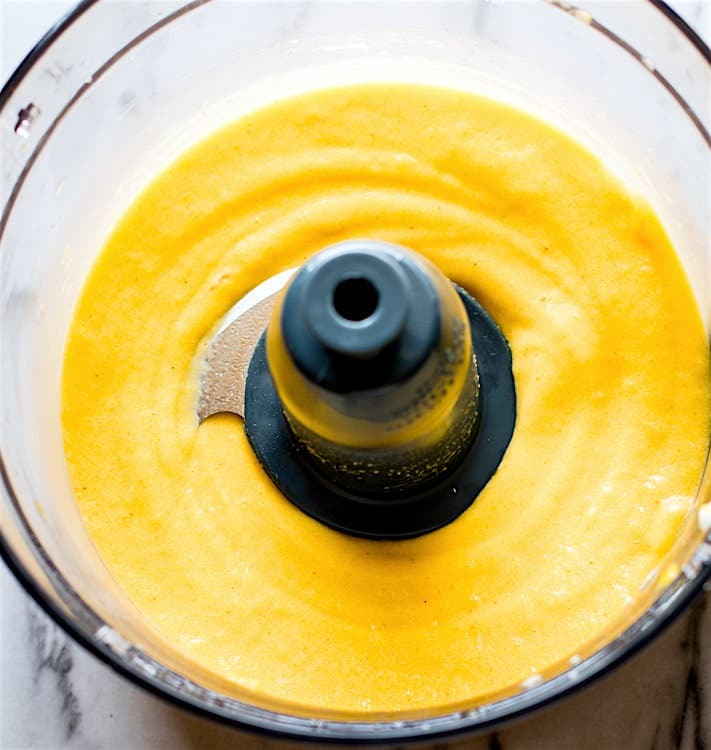 First, blend your frozen banana and mango together in a small bowl until creamy. Set aside. 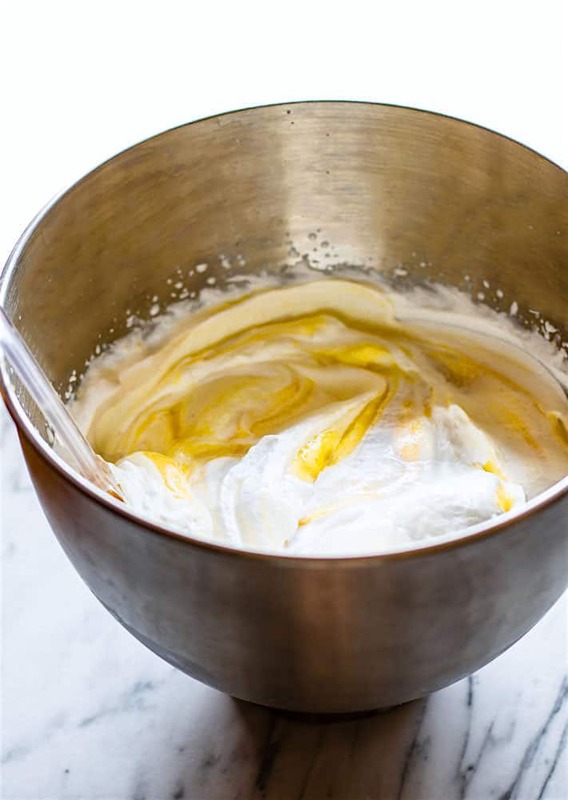 Next, place your cream (pre-chilled coconut cream or heavy whipping cream) in the bowl of a stand mixer. Blend on medium high speed until soft peaks are formed. If desired, add in a few tablespoons of agave/honey/or maple syrup while mixing. Once soft peaks have formed, slowly and gently fold in the banana mango mixture until everything is incorporated. Fold in the rest of the ingredients. Raisins, cinnamon, vanilla, etc. Pour mixture into a 9×3-inch metal loaf pan. Best to have the baking pan lined with parchment paper to cause less sticking. Fun option! Soak your raisins in 1/4 cup rum for 1 hour or so, until they plump up. Then, add to ice cream before chilling. A great rum raisin dessert! Feel free to sub raisins for chocolate chips, nuts, etc! See my whipped coconut cream post for details on how to chill coconut cream before whipping. When using the coconut cream (for vegans) the texture will be more like soft serve/frozen yogurt but still TASTE like creamy ice cream. If using coconut cream, the ice cream will harden quickly in the freezer. You can place it in the freezer first for a few hours, but it will need 30 minutes or so to thaw before serving. If you keep it in the fridge it will turn into more of a yogurt base. If you use the heavy whipping cream, the texture will be more like ice cream. Both are DELISH!! The nutrition shown below is for the ice cream made with coconut cream versus Heavy whipping cream. They are very similar except the heavy whipping cream has a few more calories. Did I mention my dad is one of my best friends still to this day? Yep, sure is! Blessed beyond measure. So cheers to making fruit sweetened no churn ice cream, and to making new memories with those you love. BIG cheers to the wonderful fathers who take their kids to get ice cream and talk “life,” even when the kid has melted ice cream all over their face. As a kid, what was your favorite ice cream flavor? Have you ever made a no-churn homemade ice cream recipe? Fruit sweetened or vegan ice cream? I’m with you about ice cream, there’s no replacement for really classic creamy ice cream. 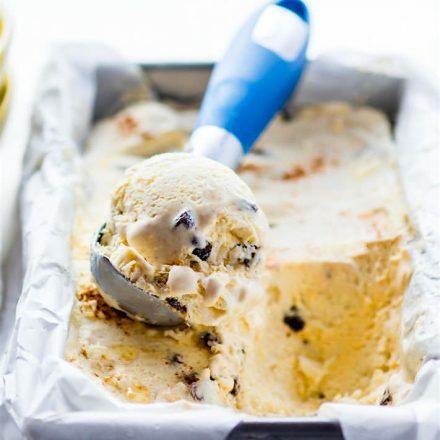 This looks just beyond amazing and I’ve had ice cream on the brain lately – love that it’s no churn! I’m really not a huge fan of the heavy fat stuff, as you know. I think the only super premium stuff that I really liked growing up was ben and jerrys, actually! But put chocolate in there, and I”m sure I could be convinced! oh yes, true! then banana CHOCOLATE soft serve is on my list to make for you! I love any and all ice cream unfortunately my lactose intolerant belly not so much! I am so making this recipe when my Mom comes for my surgery in. August. She eats the weight watchers ice cream which makes me cringe inside because the ingredients are so questionable! yea!! have you tried the coconut cream version then? so good! ice cream is my jam!! i could eat this every meal of the day!! I could too! Ahh especially in this summer heat! oh my gosh this is super creamy and looks perfect!!! Pinning! thanks friend! let’s share a bowl together soon! mmm k? YUM! I totally want a scoop of this, Lindsay! Wow…this is amazing! I had NO IDEA that you could make something so creamy and healthy but also delicious…and it tastes like regular ol’ ice cream? I’m sold! I was amazed myself. Totally a great treat for whole family! This looks BEYOND creamy! And I’m so happy that there are no added sugars–JUST fruit! 🙂 It probably is just as delicious as it looks! I have to try it out ASAP! I love the taste of creamy, sweet and light ice cream! Holy makerel, I had no idea you could replace condensed milk with fruit and have it turn out soooo creamy dreamy amazing! Loving the banana-mango combo. This is a winner, for sure! Yes! It’s magical I swear!! Total decadence, Lindsay! I must admit, I’ve made something similar to this before save freezing it (and an unfrozen banana). We ate it as a mousse… and OMGeeee I get it! SO now, the next step is freezing it. I’m writing an ice cream post for next week and am contemplating no churn ice creams. I’ve tried several and I just can’t seem to get past ice crystal formation in no churns. I can’t get the smooth silky mouthfeel I’m looking for. Perhaps this will be the one I’ll get on the no churn train with!! I’ll give it a go soon! Thank you for this! So fabulous! Haha I would have loved it! Yum maple and pumpkin! So for this you whip coconut and add banana frozen fruit purée! So good!! Coconut cream in ice cream? Yes, please! My did loved ice cream, but what I remember most is how he’d eat Cool Whip right out of the container with a spoon. It drove my mother nuts! Fruit sweetened AND no churn? Summer heaven right here! nah, i just like creating recipes! hehe. this is perfect in sooo many ways! Are you kidding me!??!?! This is the epitome of perfection! I’ve never made homemade ice cream, mostly because I figured they all needed ice cream makers and ain’t no one got the room for more kitchen gadgets. And the pictures! Excuse me while I lick my screen. While I do own an ice cream maker I’m usually too lazy to clean it plus forget freezing it in advance sp this is perfect. Also: it’s pretty much fruit with some coconut = fruit salad = breakfast food, yes? And the rum raisin verson is SO calling my name. yes!!! totally breakfast. let’s just call it coconut fruit frozen yogurt. haha. Yum! I’m curious, since mangoes tend to bother my tummy (fructose malabsorption) if you think another fruit could work. Pineapple, perhaps? Or papaya? I’ve been meaning to try no-churn ice cream one of these days. I just don’t have room for an ice cream maker in my itty bitty grad school apartment! totally! you can use 2 bananas but it might taste more banana-y. If that makes sense? I would try pineapple or papaya if you want some fruity flavor. Keep me posted. I’ve packed our ice cream maker away (moving on Thursday! ), so this recipe is PERFECT, esp. because it’s no-churn. Annnnd I have tons of mangos I need to use up 🙂 wahoo!! With no ice cream maker, i’m forever looking for no-churn recipes. 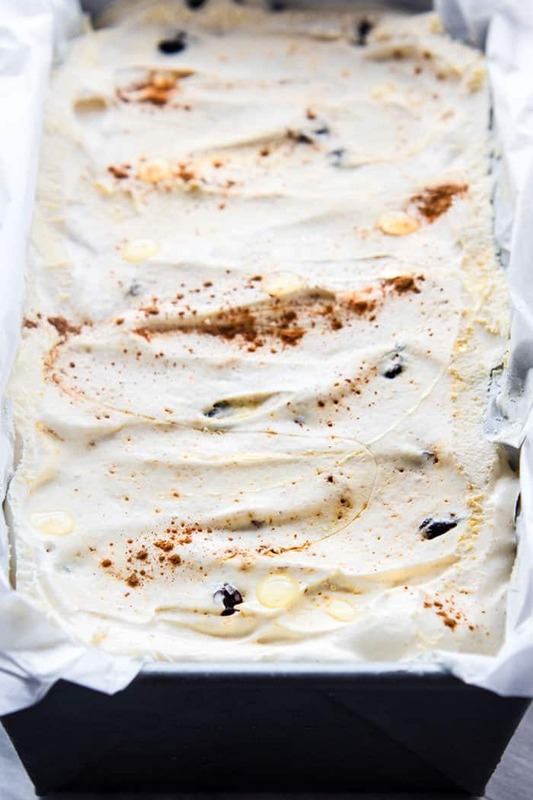 Such a fan of coconut milk, so I can’t wait to make this…especially with rum soaked raisins?! Hello! I loved nearly all ice cream flavors as a kid – Neapolitan might have ranked at the top. Ok so curious…..think I could do this without banana? I’m probably the only person on earth that doesn’t like them ? No prob!! I think just add more mango or some starchy fruit would work best. Let me know if you try it . Hi~ Me too…… Not really like banana…..
It’s tasty! I will try to make it for my family. I hope i can do and they like it. Thanks for sharing! Regarding the vanilla in this recipe, is that vanilla bean or vanilla extract? Or something else vanilla? just updated it! 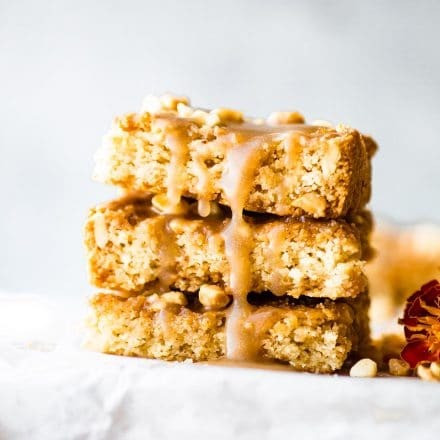 I used vanilla extract but vanilla bean would be amazing too! oh great idea! I will have to try that next! yea! the real cream version is my fav. I can do it too! Ahh especially in this summer heat! I can do it too! for especially in this summer heat. Kind of disappointed. I used the heavy whipping cream and the ice cream got really hard in the freezer. Couldn’t even scoop it. Had to break pieces off with a knife. Ugh. Is there a way to keep it from getting so hard? I didn’t use mango, just banana and added some cocoa to make it chocolate. Hi Melanie. So sorry to hear about this! Did you let it sit for 5-10 minutes at room temp before scooping? Was the heavy cream chilled beforehand? Adding ⃣banana helps make it less icy. If you send me exactly what ingredients and method you used, I’m happy to help! 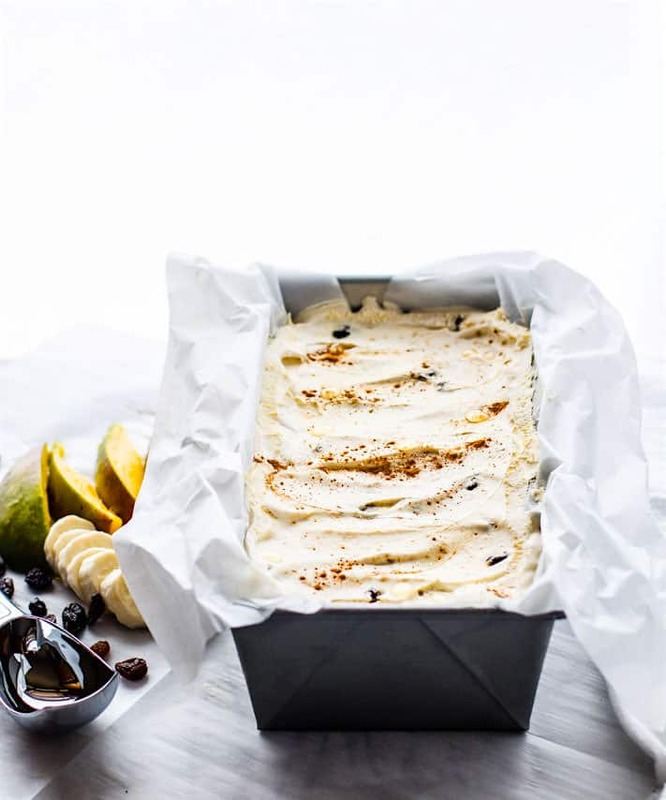 Fruit Sweetened No Churn Ice Cream, thank you very much for sharing this awesome article. Now that it’s warm up, ice cream is welcome anytime, especially when we can do it at home and do it exactly with the ingredients we want. So so good! Cream is LIFE! I can’t wait to try this! Can I ask why banana and mango? 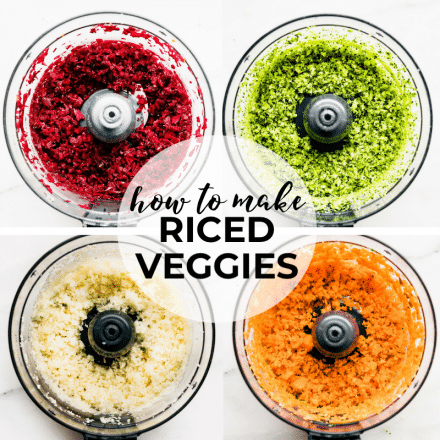 Can I use another starchy fruit or veggie? I used mango because It gave it a more tropical taste. But banana totally works! Wow…amazing! this is super creamy, I love the taste of creamy, sweet and light ice cream. Yes–makes complete sense. I’ll give it a try sometime!